The best Umbrian wines, classic wines, handmade and long-lived, fascinating and overwhelming. You will find born to be unique wines, excellent products which are best represented by the noble Rosso Torgiano Riserva and Sagrantino di Montefalco. A product excelling Umbrian and Italian food through unique deep aromas, seductive both for the body and for our cooking. Check out our whole selection of Umbrian Extra virgin olive oil: the best choice available! If you taste these products, you will have the feeling of travelling back in old times, where Umbria was plenty of only genuine and natural products, and these magnificent pecorino cheese still treasure these old fond flavors. Not to be missed! Let yourself captivate by the exciting smells; the Umbrian truffle donates nobility to every course and makes the truffle a refined and precious ingredient! 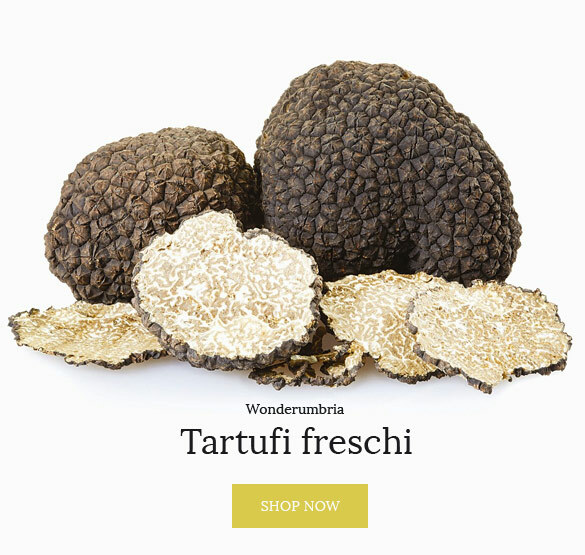 Visit our wide range of Truffles products! Umbrian typical products are among the most requested food products, both in Italy and abroad and characterized by its authenticity, simplicity and unique taste. A typical food product is, generally speaking, an agricultural product, which manufacturing complies with the rules and follows well-established methodologies, which determined the conservation and aging procedures, resulting in first quality products firstly and foremost locally recognized. Our business specializes in Umbrian typical food products and offers a wide range of first level choice including an on-time fast delivery. As mentioned, Umbria is famous for the authentic and simple food and dishes with a unique distinctive taste. Some of the most appreciated Umbrian flavors are cold cuts, mostly from Norcia, and well known thanks to its old gastronomical tradition of typical Umbrian food production. Wonderumbria specializes in Umbrian food products, especially in Umbrian cold cuts, perfect snack to share together. Among the best requested products in our website, the palle del nonno are certainly present, a typical cold cut finely minced with a low fat mixture and an unusual rough shape containing a unique taste, able to satisfy your palate from the very first tasting. We also offer among other Umbrian flavors which will surely stimulate your senses, the most renowned coglioni di mulo made with a fine mixture and with a central lard line as a main feature like colonnata; named after the typical cold cut shape inspired by the mule’s testicles, which helped for ages the mountaneers in the Appennines to move heavy burden between unpassable paths. Visit our online catalogue and discover our exclusive Umbrian products: from pasta to cheese, from wines to cold cuts! The best of Umbria directly at your table! Delis and typical Umbrian products: sale online the best culinary traditions of Umbria select from WonderUmbria.